Blue-Grey Education Society visits fort - On the freezing cold Thursday evening of February 6, 2014, several members of the Blue Grey Education Society paid a visit to Fort DeRussy. A good time was had by all. Friends of Fort DeRussy Get Cotton Bales - You’re all aware of how significant cotton was in the history of the fort. Friends of Fort DeRussy has been able to obtain two authentic-looking, burlap-wrapped cotton bales for display. 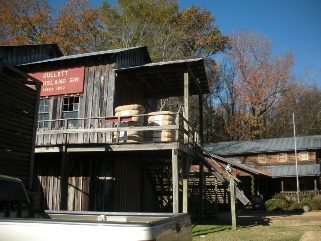 We had to go to Mississippi to get them (from the Bisland Gin in Jackson, the oldest operating cotton gin in the country, formerly located near Natchez, Mississippi, and now run by the Miss. Department of Agriculture at their museum in Jackson), but they are now on display at the Forts Randolph and Buhlow State Historic Site in Pineville. But they do belong to FFD, and will be available for activities at the fort that might need them. Flood Status of the Fort - The field between Fort DeRussy and the levee has been threatened with flooding from this year's "Great Flood of 2011," but on May 18, 2011, the forecasted crest at Acme was dropped five feet. This should ensure that, given no levee breaks between Vidalia and Lake Providence, the field will not go under. If anything changes, appropriate comments will be made. High Water Update - All threat of flooding at Fort DeRussy is over, as of July 2011. The water never got nearly as high as predicted, and the nearest flooding to the fort was about three miles away. The water has since gone down. Friends of Fort DeRussy was honored to host the visit of Ghostjoes on the night of November 6, 2010.Ghostjoes is a paranormal investigation group composed of eight Fort Polk soldiers (G I Joes). The men and women of Ghostjoes arrived about 6 PM and stayed until 1:30 AM, in spite of the temperatures in the 30s. The main spooky happening of the evening was the disappearance of several of the chemical light markers that had been left to mark certain points, but that was quickly determined to be caused by a local inhabitant who was trailing the group. The group investigated the fort's west wall, the field between the fort and the river, and the cemetery, and left with enough unexplained phenomena to make them consider their night well spent. "Raffle Report - As mentioned last month, the KCWRT raised $417 for historic preservation last year. Jim Frey was the winner of the end-of-the-year drawing to see who gets to choose the Civil War battlefield that will receive these Round Table raffle proceeds. Jim has decided to divide the funds and make contributions to sites associated with two of our former Albert Castel Award Winners: Mansfield Battlefield (Gary Joiner) and Fort DeRussy (Steve Mayeux)." The Book is Out! - As of August 15, 2007, Earthen Walls, Iron Men: Fort DeRussy, Louisiana and the Defense of Red River (University of Tennessee Press, by Steven M. Mayeux, with foreword by Edwin Bearss) is available in bookstores. After ten years in the writing and two years in the publishing process, the book we've all been waiting for is now available to the general public. Retail price is $45, but most online bookstores sell at a generous discount. If your local bookstore does not have the book in stock, they can order it for you. If you would prefer to buy a signed copy, they can be purchased from the author for $44. Send orders to Steve Mayeux, 7162 Hwy 29, Cottonport, LA 71327. A. M. Pate, Jr. Award - On November 21, 2007 the Texas Civil War Round Table of Fort Worth announced that Earthen Walls, Iron Men was the winner of the 2007 A. M. Pate, Jr. Award, presented for "the best original work on the Trans-Mississippi sector of the Civil War written in the past two years." Mayeux traveled to Fort Worth on December 11 to accept the award. Albert Castel Award - Earthen Walls, Iron Men has also been named the winner of the 2008 Albert Castel Award, presented every two years by the Kalamazoo, Michigan Civil War Round Table for the best recent book on the Civil War in the Western Theater. Mayeux traveled to Kalamazoo on September 19, 2008 to give a presentation on his book and receive the award. In addition to the award, the Kalamazoo CWRT made an additional donation of nearly $500 to Friends of Fort DeRussy. Fort DeRussy Battle Reenactment - The 2007 Reenactment took place as planned on December 1-2, and was a grand success! Over 700 spectators toured the camps and watched the battles over the two day period. The weather was perfect, and the parking area dry enough that no one got stuck. The reenactors feasted on genuine Louisiana gumbo on Saturday night, then danced their Virginia Reels and waltzed to the music of a period band until they were exhausted. The reenactors, spectators, sutlers, food vendors and State Parks personnel all left the site happy. We look forward to more reenactments to come. The campsite at night was something you all should have seen. At least forty tents were there, illuminated by campfires, candles, and coal-oil lanterns - not an electric light in sight. And as people turned in for the night, the shadowy figures moved in front of the fires, the hushed voices quietly discussed the day's ventures, and here and there a mouth harp or banjo could be heard sounding out an old, nearly-forgotten tune. It was something to experience. 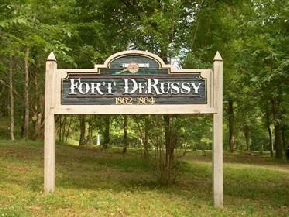 Friends of Fort DeRussy was responsible for powder rations for the artillery that attended, and the cost was significant. The spectators were very generous with our donation pot as they left the battles, but if anyone else would like to kick in a little to help out, it will be appreciated. Banks' Grand Retreat - This unorthodox and ultra-authentic Civil War reenactment, held in the Kisatchie Hills of Natchitoches Parish March 14-18, 2007, raised over $3,100 dollars for Fort DeRussy, with donations continuing to come in. See our upcoming Bugle for details. Thanks to Fred Baker, Tom Kearby, Bill Treadway, Mrs. Terre Lawson and Doug Cooper (organizers), and all the participants at Banks' Grand Retreat. Hope you had a good time, and that your blisters heal quickly. "Lazy Jacks" visit Fort - Fourteen members of the "Lazy Jacks," a Civil War reenactment group visiting Louisiana from Great Britain to participate in "Banks' Grand Retreat," visited Fort DeRussy on Monday, March 19, 2007. They toured the Main Redoubt, the Water Battery site, the Cemetery, and even made a stop at Nolan Bordelon's "Dog House" for refreshments. The Lazy Jacks are a fascinating group of men, and it was a real pleasure to have them at the fort. 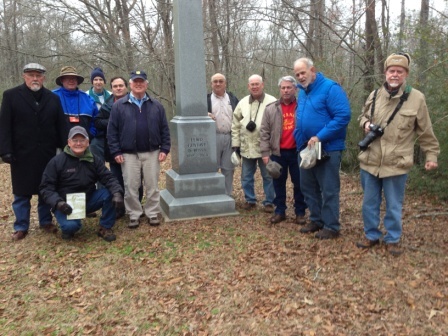 Amazingly enough, although they had spent the previous five days traipsing through the "howling wilderness" of Kisatchie National Forest raising money for Fort DeRussy preservation, these men took up another collection before departing and came up with an additional $275 for Fort DeRussy. Three cheers and a tiger for the Lazy Jacks! NOTICE TO REGULAR VISITORS TO THIS SITE: You probably noticed that we went for a year or two with nearly no "new" material on this site. Those days are now over. There is a considerable amount of new material that has been added here starting in early December 2009, and we hope to keep that up. We've added pictures of men who served at the fort, two of our latest newsletters, and several new pages to "Facts about Fort DeRussy." The information on the "US Navy at Fort DeRussy" page has been growing almost daily. We invite all of our regulars to visit this new information. And for our new visitors, Welcome Aboard. Look around, and learn a little bit about Fort DeRussy. LATEST NEWS: This website has been untended since sometime shortly after the above paragraphs were written. Yep, that’s right. We’ve been locked out of the website since late 2011 or so, due to software problems. You may have noticed the new look to the site - that’s because it had to be totally re-done. As of New Years Day, 2014, we are back up and running. As I look at the new site, I see there are some minor changes and improvements that still need to be made, and now that I can actually make changes, that will start to happen. Sorry it’s been so long, we hope to continue to improve the site from here on.